We have an unfinished basement. We'd like to have a finished basement. So we can build something fabulous like this. . . 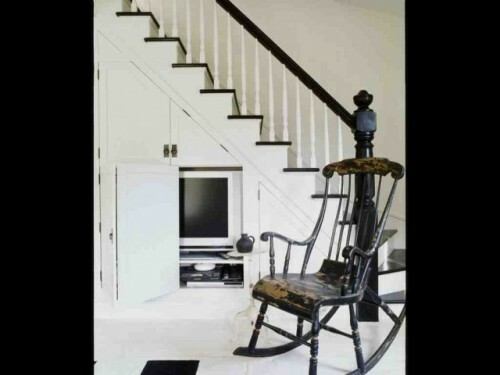 But we'll probably endup with something more like this (minus the rocking chair). . .
traditional staircase design by new york architect SchappacherWhite Ltd.
since Handyman is pretty firm on having the entertainment technology housed in a closet under the steps. I can just add little frames to the steps in the above photo and we both win. But we've needed to take a number of baby steps before we can start framing and finishing the space. One of the steps we've taken is to rid the space of the extra stuff that we don't want to frame around, like extraneous gas pipes and plumbing lines. Our space is pretty small, so we want to take advantage of all it. And now we have all new nice and modern plumbing. We also capped and removed an old stack that ran to a dry well in the backyard. Now it's all consolidated into one nice little space that we can frame around without creating extra an bulkhead, bump out, or soffits. A bunch of the old removed plumbing. And yes, the whole rest my basement is the same painted green color. And sadly, this box is still patiently sitting in my garage awaiting its new home in scrap metal heaven, because this is not the kind of stuff you can just dump in your garbage can for the next trash day. You can also see how old and corroded it was getting inside. Here's a photo of the where the old stack was, all capped. Now it can hide away behind the drywall. Pretty boring stuff*, but it makes me happy. And it's one baby step closer to customizing our little yellow cape. Great photos! We semi-finished our basement last fall. The plus side was that we got rid of so much unwanted junk! 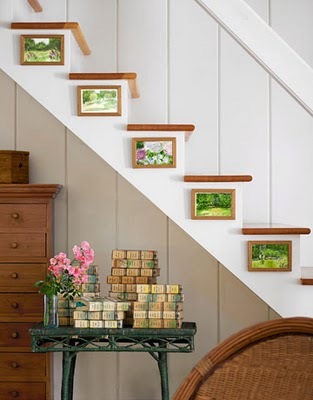 Love the idea of the pictures on the sides of the stair risers. Thanks for inviting me over, I loved looking around. 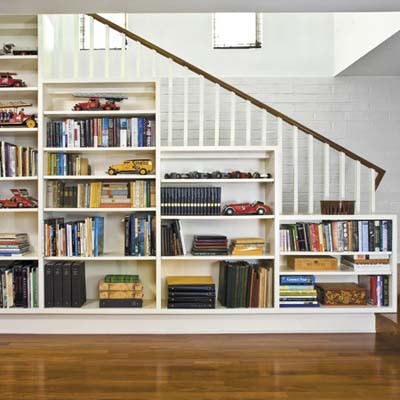 I am in love with the bookcases by the stairs, that would be perfect in my house especially because we LOVE to read and are always needing more places to store our books!! This makes me scared to look at our plumbing! No telling what we will find. Thanks for stopping by! I'm now following you. 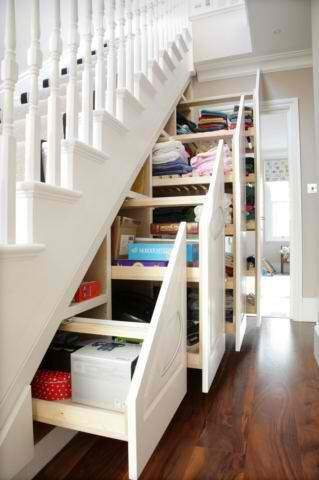 I love the under-the-stairs pullouts. Very clever use of space! Love the different stair options. We put drawers in our basement steps. 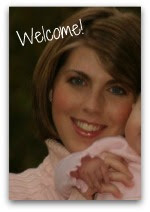 Thanks for visiting saving4six and commenting on my hope chest. Basements ROCK! We dreaded going to ours,and now we LOVE IT!!!!!!! Yes! Finally something about mens health.